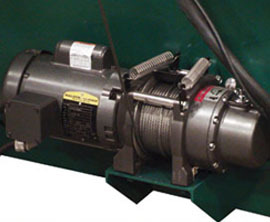 The KRB Winch System makes it easy for one man to load an automatic stirrup bender. The winch pulls coiled rebar up to the machine making it easier and safer for one man to load. Save time on change over and reduce operator fatigue by installing a KRB Winch System on your Automatic Stirrup Bender today.